The hospedaje that we stayed at, Los Quatro Hermanos (4 brothers), is typical of the places that we have been staying. For 4,000 pesos/person ($6 US) you get a bed, breakfast & hot shower. Most hospedajes do not have a hot water heater, but rather a mini-furnace on the wall next to the shower, which is lit prior to turning on the hot water. As the flow through the hot water pipe increases the furnace is activated, heating the water. However, if there is not enough hot water flow, or too much cold water flow, the furnace shuts off, resulting in a rather digital shower- piping hot or freezing cold. After a bit of practice one can manage to get the temperature correct. As we crest the ridge just north of Coihaique the fresh, moist air of Aysen rises to greet us from the Rio Simpson valley. Three windmills turn lazily in the light breeze (go figure- windmills and no wind). 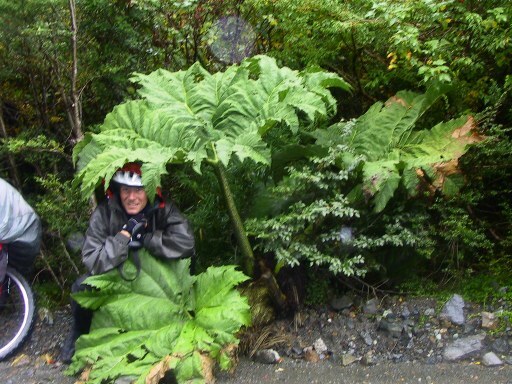 As we cost down the other side, we ride in to a lush temperate rain forest environment with deciduous trees covering the hillsides like moss; bamboo and fern running rampant in the undergrowth. 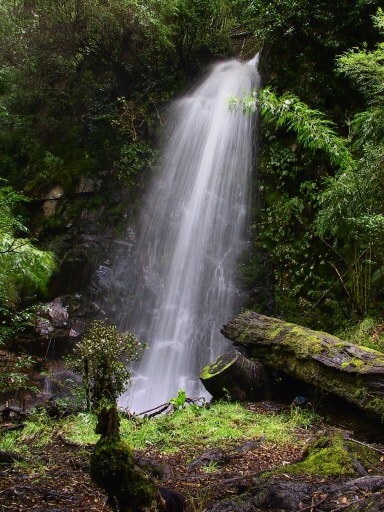 Water is everywhere; dripping from leaves, running in rivulets down the hillside to meet the road every few yards and, of course, falling from the sky. 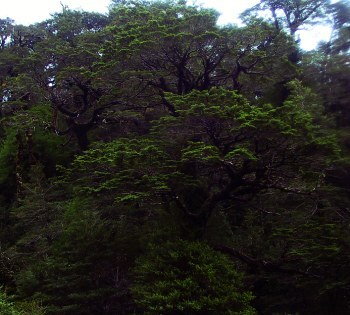 The Rio Simpson valley is broad and flat on the bottom, with steep thickly forested hillsides. 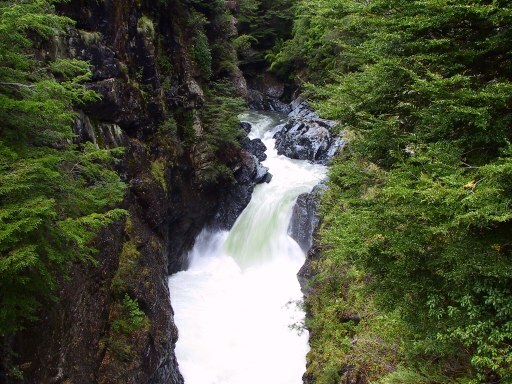 There are many streams flowing down the hillsides to join the river, and they are often seen leaping exuberantly over cliff bands and falling hundreds of feet before disappearing into the forest again. I, of course, am all caught up and excited by all of this exuberant leaping going on, and stop every ten minutes for photos. Mandy, on the other hand, is enjoying the long downhill ride on pavement. I round a curve and find Mandy digging through her bag to get out the bike pump (don't ask why we only have one- that's another long sad tale). She hands it to me and says "I'll meet you at the intersection 20km down the road". And so this becomes our modus operandi for riding from now on. Mandy forges ahead enjoying the turning peddles and wind in her face, while I lollygag around taking photos, snacking, drinking, etc.- generally enjoying myself- and we rendezvous at a particular location or time later on. 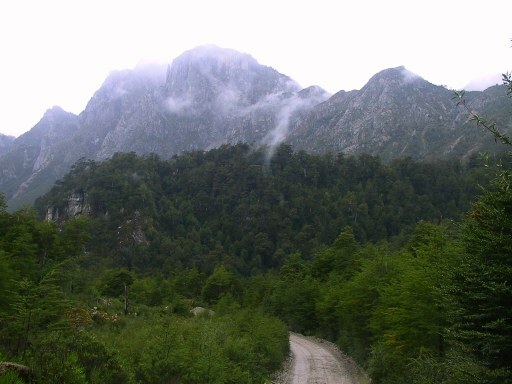 In the early afternoon we reach the confluence with the Rio Mañhueles and turn to head up the valley to the town of Mañhueles. Although it is generally up hill, the road is still paved and not steep, and we make good time. The rain starts to fall in earnest about an hour out of Mañhueles, and by the time we get to "town"- a desultory collection of tin shacks- we are soaked. Being of sound mind and body, I express my earnest desire to Mandy to find a hospedaje in which to dry off and spend the night. But Mandy has had enough of hospedajes and would rather camp under the trees across the road. That wasn't dry enough for me, so we compromised and headed up the hill to pay $5 for a CONAF (Chile's forest service) campsite with a shelter. 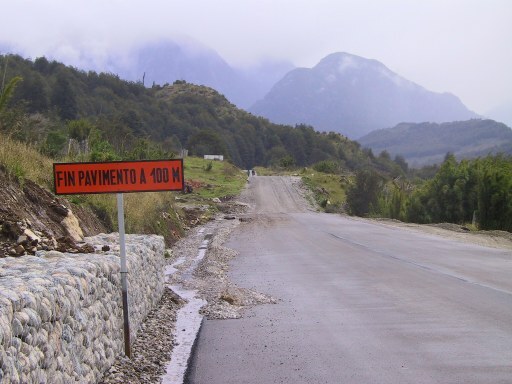 The road out of Mañhueles was paved for a while, then we ran into a couple of kilometers of construction, and then the dreaded sign: Fin Pavimento. 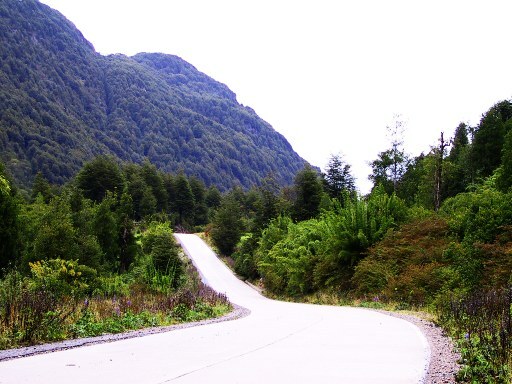 Not that we expected, or even wanted, the road to be paved the whole way, but after the nasty washboard ripio of southern Patagonia we approached the end of the pavement with trepidation. The road was about a lane and a half wide with three hard packed tracks that had potholes between and loose gravel on the outside. We expected the nasty washboard to begin around each bend, but it never materialized, and the riding was quite nice on the packed tracks. Yea! Finally some fun dirt riding without wind or washboards. One still had to be constantly vigilant for the occasional loose or rocky section, but otherwise the riding was great. End of the road? Nope- just the beginning! So we spent the rest of the day riding up and down hills, over streams and winding through the forest in rain and mist, finishing the day in the pouring rain in Villa Amengual- another unattractive collection of tin shacks similar to Mañhueles. This time we opt to spend the night in the only hospedaje in town. 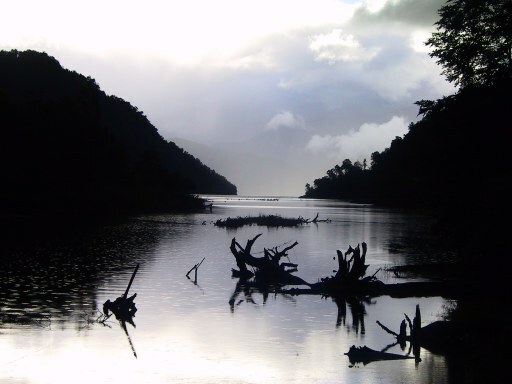 The long and winding Camino Austral. There was a peculiar phenomenon this morning- parts of the sky were blue. There was even this big yellow thing up there. Hm. Not to fear, around noon all was clouds and rain again. Getting out of the rain under the leaf of a Nalca plant. Most of the ride down the Rio Cisnes was nice, with the exception of one section that they were widening to two lanes (why one section in the middle of nowhere?) The construction zone was about 4km long, with new dirt and gravel being layered on top of our fine little road. The result was mud, about three inches deep. Ugh. While riding through it I was thinking that if it lasted much longer we would have to stop and hitch a ride. Thankfully it ended and we were back to our nice little lane-and-a-half road dodging potholes once again. After passing an impressive rapid at Piedra del Gato on the Rio Cisnes, we arrived at the junction for the road to Puerto Cisnes. After a short break for lunch we continued north on the Camino Austral, entering PN Queulat and winding our way up to Portozuelo Queulat. The hill climb up to Portozuelo Queulat doesn't have a name, and Cuesta Queulat is rather boring because everything is fill-in-the-blank Queulat around here, and since we already rode the Cuesta del Diablo I'm dubbing it the "Stairway to Heaven". Steep switchbacks with incredible views. Off to the right some large old growth trees; to the left a hanging glacier; a bit further on a waterfall. Very, very cool. At one point I stopped on the outside of a bend to photograph yet another beautiful waterfall when a pickup truck came zooming around the corner heading straight towards me with a little old lady at the wheel peering up at the same waterfall that I was photographing. She swerved at the last minute, then came to a screeching halt and backed up and kindly asked if everything was OK. "Si" I replied, thinking to myself "As long as you don't run me over!"